Even if you've already gotten through your entire gift shopping list, you probably have a lot of wrapping ahead of you. Trying to keep track of tape, wrapping paper, ribbons and bows is difficult to do when you're set up on the floor, though. That's why you should consider setting yourself up with a gift wrapping station. 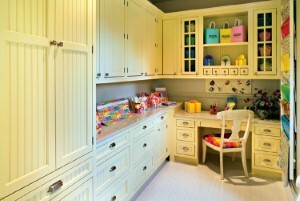 According to Houzz.com, organization is the most important thing to remember as you're designing your wrapping station. That means you'll need custom cabinetry so all of your gift wrapping essentials have their own space. Rolls of wrapping paper and spools of ribbon can be strung on vertical rods within your custom cabinets, while baskets of bows, scissors, to/from tags and rolls of tape can be neatly stored within. Of course, you'll also need a workstation, which can be anything from an island to a tall table to a countertop. Keep in mind that it's easy to transform a corner of your home office, a closet, the laundry room or a nook in the guest bedroom into your wrapping space - you don't need to set aside an entire room!